Open Education Week, March 27-31, is an opportunity to celebrate and raise awareness about the abundance of free and open educational resources (OER) available to teachers and learners around the world. OER are written by experts and often peer-reviewed, just like their commercial equivalents, but they are published under open copyright licenses so that they can be downloaded, distributed, and adapted for free. Many excellent examples of OER are available through online portals such as OpenStax College, the Open Textbook Library, OER Commons, BCcampus, and MERLOT. To celebrate the growth of OER and the exciting opportunities they present, educational institutions from all over the world are coming together during Open Education Week to showcase what they are doing to make education more open, free, and available to everyone. To mark the occasion at FSU, University Libraries and the Student Government Association are partnering to bring the #textbookbroke campaign to FSU. #Textbookbroke is a national campaign aimed at informing students about open textbooks, OER, and other low-cost alternatives to traditional textbooks. It is also aimed at empowering students to provide feedback on their course materials and encourage their instructors to explore more affordable alternatives. Stop by our event tables at Strozier Library on March 28th and Dirac Library on March 29th to share how much you spent on textbooks this term and learn about textbook affordability initiatives at FSU! In addition, FSU Libraries will also announce the successful applicants for its Alternative Textbook Grants program, which was launched in late 2016 to support FSU instructors who are interested in adopting or remixing open textbooks and educational resources to replace commercial course materials. Based on the applications we have received thus far, participating instructors could save FSU students up to $100,000 by the spring of 2018! Did you know that the e-journals you access through FSU Libraries are unavailable to most students and researchers in the developing world? What about people here in the US? Did you know that most members of the general public also don’t have access? The internet has revolutionized the way that we share and access information, yet most scholarly e-books and journal articles remain locked behind paywalls for the average reader. 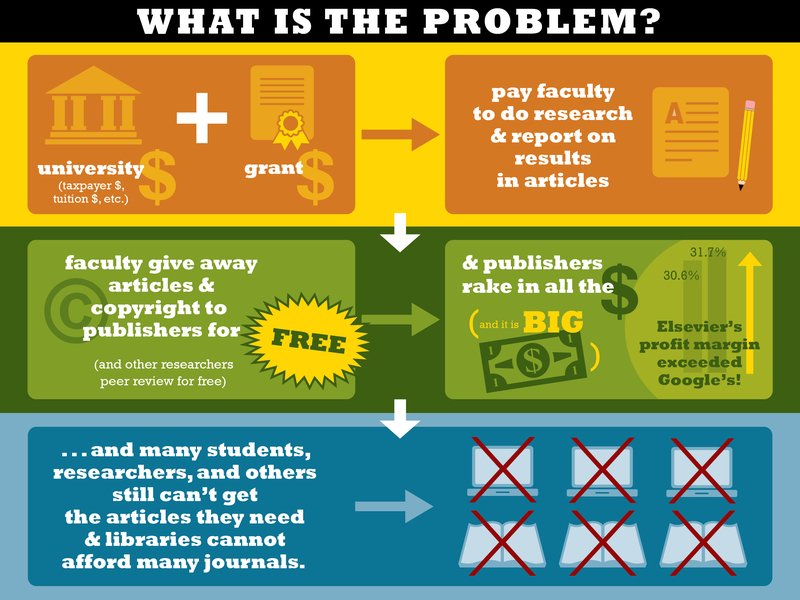 Open Access is a movement based on the principle that this situation is fundamentally unjust, and that the fruits of academic endeavor should be freely available to the public. Open Access is also increasingly becoming a requirement for recipients of research funding, with governments and funding agencies increasingly adopting public-access policies to make the results of funded research accessible to all. Making your work publicly available can also benefit you as an author, increasing the reach and impact of your work by making it more discoverable and potentially generating more downloads and citations than you would if your work remained locked behind paywalls.